Peque Gallaga on Erik Matti&#39;s claim that FAP played politics: \"Nainsulto ako... [Pero] wala akong galit. Tapos na sa akin.\"
Peque Gallaga on Erik Matti’s claim that FAP played politics: "Nainsulto ako... [Pero] wala akong galit. Tapos na sa akin." Director Peque Gallaga on why he picks Transit over OTJ: "In Transit, those are real people for me. Tunay na tunay, buhay na buhay... It gave all of us another look into the OFW problem. Transit was very powerful as a movie. At the same time, it was so delicately done and it was very sensitive." For veteran director Peque Gallaga, his clash with Erik Matti over OTJ (On The Job) is all water under the bridge. In fact, when a magazine team informed him about a pictorial that would feature him and Erik together, Peque did not raise any objections. "We have a pictorial this week. And they asked if I have any complaint with any of these people, and sabi ko, wala," Peque told PEP.ph (Philippine Entertainment Portal) in an exclusive interview last October 29 at the ABS-CBN compound. It will be recalled that Peque was the head of the Film Academy of the Philippines (FAP) committee that chose the Philippines’ entry to the Best Foreign Language Film category of the 2014 Oscar Awards. The FAP committee voted for Hannah Espia’s diaspora film, Transit, over Erik Matti’s crime drama, OTJ (On The Job), and Brillante Mendoza’s drama film, Thy Womb. According to an update published in the FAP website, these films figured in a three-way fight for the coveted Oscar slot. Transit—starring Irma Adlawan, Jasmine Curtis Smith, Ping Medina, and child star Marc Justine Alvarez—is about an OFW migrant family in Israel faced with the threat of deportation due to a new law passed by the Israeli government. In response to this decision, Erik claimed that there was politics involved in choosing this year’s entry to the Oscars. To this, Peque admitted, "Napikon lang ako kasi seryoso ang grupo [FAP]. We took the voting very seriously. "And for someone to say na pinulitika sila, that was irresponsible. "Parang, teka muna, seryoso naman kami. "Nainsulto ako. But I don’t hate him." Peque also took the opportunity to clear up something about the voting process. "Galit sa akin ang ibang Noranians kasi, sabi nila, I voted against Thy Womb. "But I was chairman of the committee. I don’t vote. I break the tie. "Akala nila I broke the tie, but walang tie. "I didn’t vote, but I was going to vote for Transit anyway. It was my choice. "Then, ang nangyari pa, wala si Gina [Alajar, one of the committee members]. "We have to sit down and ask her why she is voting this way. Kaya naging dalawa ang session namin. "In other words, you try to be fair." THE MENTOR. Peque also looked back on the time when he was still mentoring Brillante and Erik. "Dante [Brillante Mendoza] was my art director, and we worked together in so many commercials. I’m so proud of Dante. "Erik is my student. He was my protégé. "Even Dante, I gave a workshop to Dante on production design. When Peque does see Erik at the pictorial, he says he will talk to the director of OTJ. "Wala akong galit... tapos na sa akin." What is Peque’s reaction to the fact that Transit ranks among the top 30 films predicted to earn an Oscar nomination for Best Foreign Language Film? He said, "Alam mo, ang galing-galing ni Erik Matti sa cinematic style. "Yung mise-en-scene na ginawa niya for the San Juan [St. John the Baptist] festival, grabe. 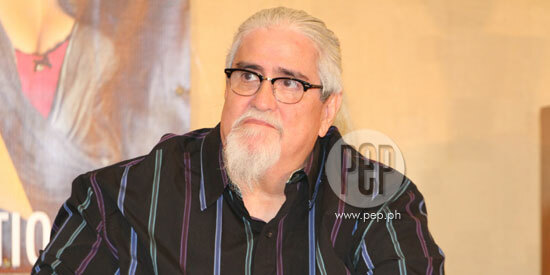 "Pero a lot of the criticisms—the characters were not real people. "Pero hindi kasalanan ng actors, kasalanan ng script. "That was the biggest complaint against OTJ. "In Transit, those are real people for me. Tunay na tunay, buhay na buhay. "It was the first time to have an OFW movie na hindi sa States, nasa Israel. "It gave all of us another look into the OFW problem. "Transit was very powerful as a movie. At the same time, it was so delicately done and it was very sensitive." CHALLENGES OF ACTING. The director known for the classic film Oro Plata Mata will showcase his acting skills for the Cinema One Plus entry titled Woman of the Ruins. Keith Sicat specifically asked Direk Peque to be part of his film, which will be shown during the Cinema One Originals filmfest from November 11-19, in Trinoma, Robinsons Galleria, and Glorietta. The cast and crew were in Corregidor to shoot the film when they were stranded by typhoon Labuyo. "Walang cover dun, open air [yung location]," recalls Peque. The story of the movie itself is about a barrio. Peque describes the characters they play. "Ako yung nagre-record, archivist ng history of maliit na barrio. "Parang apocalyptic ito, nasira na lahat, and lahat ng buildings are in ruins. "Si Art [Acuña] burns wood to make uling and si Elizabeth Oropesa gumagawa ng kandila. "Ako ang in charge sa mga records." Aside from Woman of the Ruins, Direk Peque can also be seen in another Cinema One Currents entry: Whammy Alcazaren’s Islands. "I enjoy giving the control to somebody else," said the director famously known for knowing what he wants.